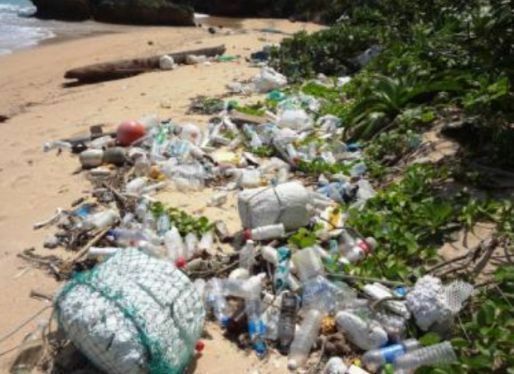 On the shores of Okinawa’s Yaeyama archipelago, Miyako Island, and Yonaguni Island, waste that contains hazardous materials such as vacuum tubes that contains substances like mercury and polyethylene waste containers is washing ashore. This dire situation was learned March 7. Haruyuki Yamaguchi, 69, professor emeritus of the National Defense Academy of Japan (NDA) and chairman of the Okinawa Conference on Policy Promotion for Coastal Waste, who has been studying coastal waste on the Ryukyu archipelago since 1998, calculated 20 years-worth of survey data. The survey ran from 1998 through 2017, covering 18 islands from Iheyajima in the north to Yonaguni Island to the far west for a total of 837 beaches. Among the waste that washed ashore, nine types of oversized, hazardous, or dangerous waste, for which removal is difficult, were identified, and the survey results attempt to understand the situation for each individually. By classification, light bulbs and mercury lamps were the most prevalent with 25,507 pieces identified, then, following in order, 8,205 fluorescent lighting tubes, 3,674 medicine bottles, and 1,020 Korean-made polyethylene tanks. Over half of these collected on just four islands: Ishigaki, Iriomote, Miyako, and Yonaguni. On the other four islands, trash such as rubber tires, syringes, and metallic drums were noticeable. Within the medical waste, items such as needles and the syringes that attach to them, as well as medical tubes that contain an opaque reddish brown liquid akin to blood collection tubes were found, raising fears of contamination risk. A majority of the polyethylene tanks were of Korean make, and it was confirmed that about 20-30% of these still contained liquid. Inside were high concentrations of dissolved lead and arsenic, as well as highly dangerous liquids that foam and have a foul odor. Of the total 1,020 polyethylene tanks found over the past 10 years, 405 of these were collected on Iriomote Island. Professor Yamaguchi, who spearheaded the survey, confirmed that the majority of the waste that washed ashore on Okinawa came from neighboring Asian countries such as China and Korea. The coastline, which is a valuable natural resource for Okinawa, is a “lifeline,” and he warns that neglecting it would also have economic repercussions.